This was a great story. It had love, loss, acceptance and learning. Cal and Jake have a strained relationship at the beginning. It’s somewhat difficult to tell if it’s jealousy or attraction. I really like how Gary and Luce were able to take in both boys and offer them something that they were all needing – family. I loved Gary. He was funny, the steady sense in this family who, at it’s core is full of love and acceptance. He knows that his wife has some learning to do but I love how he handles it. Luce is a wonderful person who just has some catching up to do. I felt that this story was more about Luce and her learning to accept than it was about Cal and Jake. However, their story was one of learning how to have a relationship, learning to love themselves and each other. The Night Screams is poignant and moving. 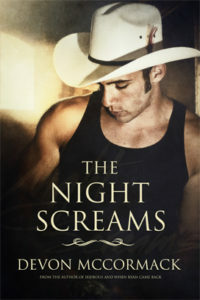 I highly recommend this to anyone looking for an emotional suspense story with romance. This is a gritty and engaging book. The characters are well developed and easy to love. The romance is realistic, and I’m glad that it’s not sexually explicit. I feel it fits the story better this way. This story addresses not only the extreme abuse that Cal endured but also social and family issues faced by many LGBTQ teens. Cal’s journey is frightening and heartbreaking at times, but there are also hopeful and heartwarming moments. Overall, I loved this book! There were a few little plot points that nagged at me through the story. The plot twist that resolved these issues solidified the 5th star in my rating. A gay man himself, McCormack focuses on gay male characters, adding to the immense body of literature that chooses to represent and advocate gay men’s presence in media. His body of work ranges from erotica to young adult, so readers should check the synopses of his books before purchasing so that they know what they’re getting into.